Also found in William Sandys, Christmas-tide, Its History, Festivities and Carols, With Their Music (London: John Russell Smith, 1852), p. 241. For my Mother to have some. I have cherries at command! What this world will be. What tre is yon standynge upon yon hylle? In tyme of yer myght fede yow y on yo fylle. How yt it blomyght now so swetly. Or ellys we may be blamyd I tell yow lythly. & it plesyd yow to labor so mech for me. Y~ for lete hy pluk yow cheryes be gatt yow wt childe. I may now gadery anowe & etyn my fylle. But yt my spowse bewryght ye kyngys son of blys, &c.
Christmas Day in the morn. In time of yer ye myght fede you y on yo fylle. How yt blomyght now so swetely. Y for lete hy pluk yon cheryes be gatt you wt childe. I may now gadery anowe & eten my fylie. But yt my spouse beryght ye kyngs son of blys, etc. A writer on carols [Hone] has remarked: "The admiration of my earliest days for some lines in the 'Cherry Carol' still remains, nor can I help thinking that the reader will see somewhat of cause for it." Different versions, with additions and omissions, are given in the modern broadsides. The version here printed has been made after a careful examination of several copies printed in various parts of England. A few verses it was thought advisable to omit, but the sequence of the narrative is supplied by prose explanations. Note that Hugh Keyte, an editor of The New Oxford Book of Carols (Oxford: Oxford University Press, 1992) believes that "Joshua Sylvestre" is a pseudonym for a collaboration between William Sandys (1792-1874) and William Henry Husk (1814-1887). See Appendix 4. 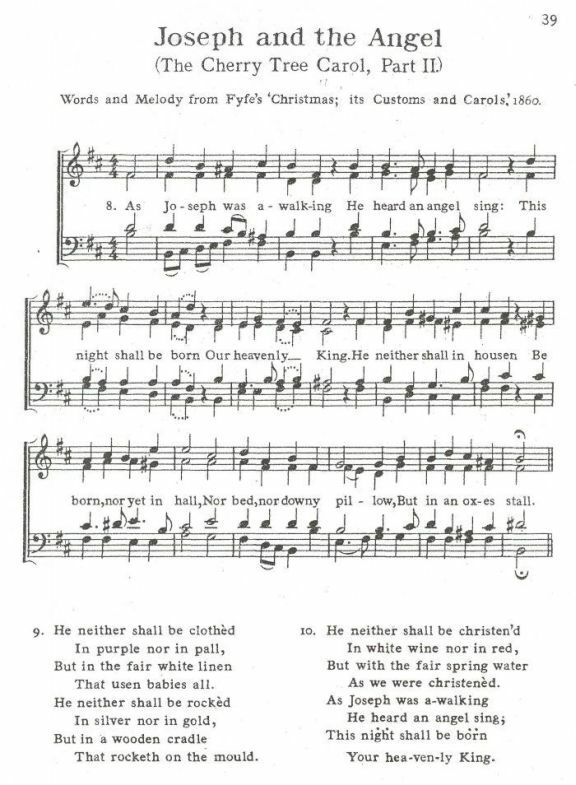 This carol has long been a favorite with the people, and is met with on broadsides printed in all parts of England. The legend of of the cherry-tree is very ancient. The fifteenth of the mysteries represented at Coventry on the feast of Corpus Christi in the fifteenth century, if not earlier, is entitled "The Birth of Christ," and the opening scene represents Joseph and Mary on their way to Bethlehem. Mary, perceiving a cherry-tree, requests her husband to pluck her some of the fruit for which she has a longing. Joseph rudely refuses in much the same terms as in the carol. Mary prays God to grant her the boon to have of the cherries, and the tree immediately bows down to her. Joseph, seeing this, repents of his jealousy and unkindness, and asks forgiveness. There are many versions of this carol, some with omissions, others with additions, but that now given [in Songs of the Nativity] seemed the most preferable. 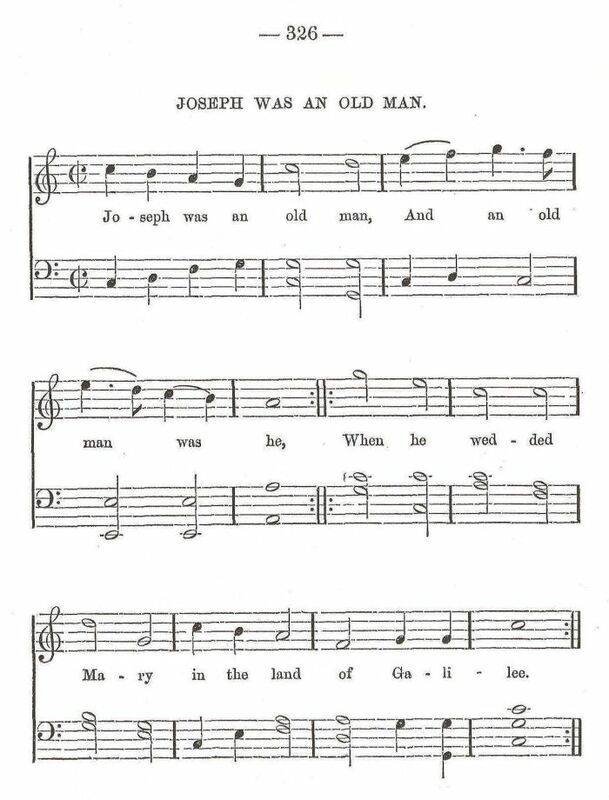 The latter portion, commencing at the verse "As Joseph was a walking," is sometimes given as a separate carol under the title of "Joseph and the Angel." Joseph's advanced age is mentioned in many places in the Apocryphal New Testament; as in the Gospel of the birth of Mary, where he is called "a person very advanced in years," and in the Protevangelion, where he is represented as saying, "I am an old man." Hone, who gives a version of this carol, says, "The admiration of my earliest days, for some lines in the Cherry carol still remains, nor can I help thinking that the reader will see somewhat of cause for it." Hone's version, The Cherry Tree Carol - Hone, differs significantly from that reproduced by Sandys. He confirms its origin in the Coventry Plays, citing the Cotton Manuscript in the British Museum, Mystery VIII. See William Hone, Ancient Mysteries Described (1823, p. 90 ante. ); reprinted by Ward Lock Reprints, Redwood Press Limited, Trowbridge & London, 1970. See, also, Corpus Christi Day and the Performance of Mysteries, from William Hone, The Every Day Book, 2 Vols. London: William Tegg, 1825, 1827 (Volume 1, June 2). See: Hone, Mystery VIII, 'The Miraculous Birth, and the Midwives'. the people ran and met together. taking every man his rod. flew upon the head of Joseph.